The solar-hot water factory project has been making strides in the right direction since we moved our manufacturing equipment to its new premises in Morwell in 2016. Toward our goal of establishing a worker-owned enterprise to manufacture quality solar hot water and other renewable technologies, our organisers Tom and Matt have been hard at work putting together a business plan to help us attract the investment we need to kickstart the project. They’ve been setting up the production line for small-scale manufacturing, building relationships with partners, and gathering the facts and figures we need to put forward a business case to government and other potential investors. 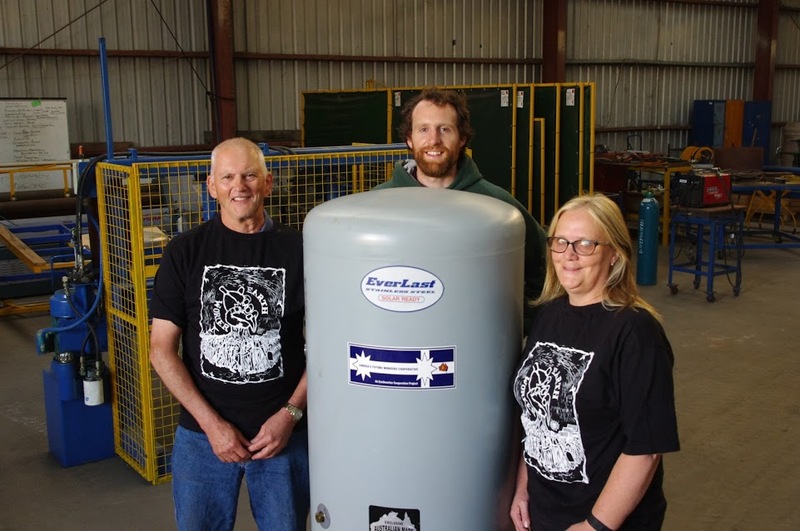 In a recent mail-out through a Victorian environmental NGO, about 650 people responded to pledge support for the project, and express interest in installing one of the cooperative’s premium ‘’Made in Morwell’ solar hot water systems in the future. Thanks to everyone who made the pledge, helping us show that the community is ready to get behind green manufacturing in the Latrobe Valley! The Victorian state government has just announced allocation of $5 million dollars to deliver solar installations and energy efficiency upgrades to the 1000 households in greatest need in the Latrobe Valley. ”This program will help some of Victoria’s most vulnerable households to make practical upgrades that reduce their energy bills”, says Minister for Energy, Environment and Climate Change, Lily D’Ambrosio. This move comes as great news for our long-running campaign asking the Andrews government to install our locally manufactured solar hot water into public housing (you can still sign our petition here). We hope to contribute to this scheme and work to duplicate it across the entire state. → Meet the organisers (Part 1) Tom Reddington!